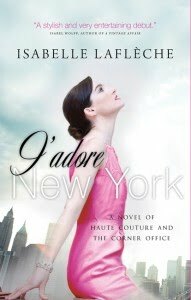 I was excited to receive J'adore New York last week, as I'd had my eye on it for a while. After all, fashion (especially Christian Dior! ), and a bright female lawyer making her way in New York after six years with the firm in Paris was something I figured would satisfy my chick lit needs! Catherine has just been granted an opportunity to move from her Paris office and relocate to New York to be with her firm. It's an opportunity that she knows could get her moving on the track of making partner, and she's not going to pass it up. Along the way, she encounters sleazy company men and a few women that would gladly cut her throat on their way to making it to the top. But amongst it all, she's got some great friends in the big city (my favorite being her lively and loyal assistant, Rikash) that she partners with to meet ultimate success, both in work and in love. The story was such a pleasant surprise -- I was already prepared for love affairs and beautiful fashion, but I certainly didn't expect to get such insight into corporate law. Catherine is a talented lawyer and one of my favorite moments was her ability to take documents that are just plain boring and chock full of the "legalese" that so often confuses the rest of us, and write it into something that actually makes sense. I giggled at another moment in which she's been ordered by one of the female partners of the firm to write a memo on something completely superfluous and silly -- and Catherine manages yet again to comply without losing her soul and with full integrity. And amidst it all, Catherine has to do the ultimate -- continue to bill and bill and bill more hours. It's one of the surest ways to making partner, so working from 7 in the morning until midnight is commonplace among the ambitious. 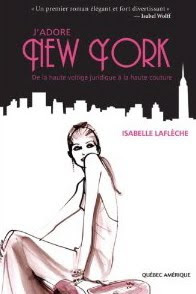 Isabelle Lafleche has crafted a fashionably fun and incredibly smart story that makes it easy to read and feel as if you are a part of New York's legal world. You'll root for Catherine as she deals with those who stir the corporate politics pot, as she successfully proves herself to her company time and again, and most enjoyably, you'll exhale in relief and happiness when a love is found! You may also see Lafleche's book with this cover overseas, which I just loved and wanted to make sure you saw! It's a fun book, and one that I could easily see being made into a film. Which French actress do you think could play a part like this? I saw J'Adore New York in my local bookstore, and it caught my eye as well. Enjoy! Ooooh! JUST the kind of read I need right now! Thanks! I do like books like this when I'm in the mood! Sounds like fun! @ Mrs. Q: Book Addict -- It's definitely a fun read! Enjoy! @ mrsodellreads.com -- It's fun! Let me know what you think when you read it!! @ Michelle (Red Headed Book Child) -- Every now and again, we all need a little lighter reading! Let me know what you think!! To all -- Now, I'm getting prepped for Halloween -- Tedious & Brief and I are hosting a read along for The Historian -- let me know if you all would like to join!! Great review. I am a new follower and look forward to your future postings. I can be found here. @ CMash -- Thanks for stopping by!! I have stopped by your blog and have also started to follow!! Stay tuned to the announcement of The Historian Read Along -- let me know if you would like to join!! Thanks Natalie for the great review! I would love to see Marion Cotillard play Catherine!! It's a very fun book and I'm looking forward to the next installment. Wow, this sounds like it's the kind of book I would love. I hadn't heard of it before, so I'm happy to read your review! That does sound like a fun book! I don't know enough French actresses to choose one to play in the movie version. @ Isabelle -- Thanks for stopping by! I agree, Marion Cotillard would be wonderful!! @ Connie at SogniESorrisi -- Oh, I am, too -- it will be fun! @ Kristen -- Let me know what you think if you get a chance to pick it up! @ bermudaonion -- It was a fun book, and I think Marion Cotillard would be a good person to pick for this role, as Isabelle suggested. She's the one who was most recently in Inception as Leonardo DiCaprio's wife -- gorgeous and really brilliant actress, won an Academy Award a couple of years ago, too! BTW, I'm loving Barefoot. It's a great summer read, even though summer is officially over! J'adore anything to do wih living in Paris and New York, and Women making it in a mans world - must find this one for my holidays soon. Thanks heaps for bringing it to our attention.as always, a great review. I love that cover and the book sounds great too! Nice title as well - that's just enough to make one want to pick it up! @ Becca -- I really love the overseas cover the best, that illustration is so fantastic! And I'm so glad you're loving Barefoot!! I really loved that story, and it was my first Elin Hilderbrand book! @ Tamara -- Thanks! I know, anything set in Paris or New York really is fun, isn't it? And yep, this character certainly is successful in that "boy's club" world --which is such a good ride, too! @ Aths -- Isn't it funny how a good book cover and title can be what draws us readers in? This one certainly does!